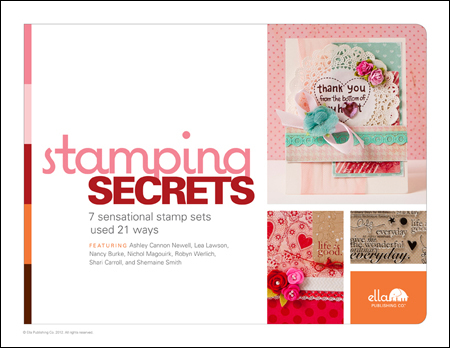 Stamping Secrets by Ella Publishing Giveaway!! Ready to make the most of your favorite stamps, and learn new tips and tricks along the way? You can get this at the great price of $8.79 -- 20% off -- until March 7th, when it reverts back to the regular price of $10.99. Even better, we have a copy that we are giving away to one random person. Just leave a comment on this post to be entered! You have until midnight EST on Thursday to enter. All entries welcome! WOO HOO!! I could really use this book!! Thanks for a chance to win. Wow I like this review and I want to win. I always struggle with stamps... I wish I could use them so painlessly... This book might just be made for me! This would be so sweet! I love tips and tricks, it stretches my scrapbooking dollar! I am really uneasy using stamps - buy a lot of them but then can't get around to use them. Would love the tutorials, could really help me get some use out of my stamps! Thanks! I would love a copy of that book. Thanks for a chance to win. I've been eyeing this book since I first heard about it and would love to win one! Wow this book looks very interesting. I would love to win it. I would love to win this amazing ebook. I have a couple of their other ebooks and they are wonderful! I have just recently started stamping more in my crafting. This book would be amazing to help me along the way. Thanks for the chance to win. This woud be awesome to win. My DH just bought me a collection of Tim Holtz stamps yesterday and this would help me with ideas and techniques. Thanks for the chance to win! I'm always looking for new ways to use my stamps and tips to make it easier. Thanks for the chance to win this ebook! It looks great! I have several Ella books and they are wonderful! As a card designer, I'm looking forward to this one! Looks like a great publication! Thanks for the chance to win! I would love to learn how to maximise the use of my stamps. Thx for the chance! Wow...I have lots of stamps...this book would be so helpful! This would be a great book to have!!! Thank you for the chance to win! Sounds like it's a great book & I'd love to win it!